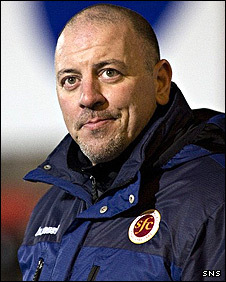 John Coughlin has resigned as manager of Second Division Stenhousemuir after his team were thumped 6-0 by East Fife. The defeat left Stenny third from bottom and seeking their first league win since 23 October. A statement on the club's website said chairman Martin McNairney had accepted Coughlin's resignation and thanked him for his work over the past three years. It added: "John has been very unfortunate, having sustained long-term injuries to key players." The Ochilview side have won only three leagues games out of 14 in the SFL this season and have scored once in seven away matches. They are, though, still in the Scottish Cup, facing a rearranged third-round replay against Threave Rovers on Tuesday. Coughlin joined Stenhousemuir in October 2007 and led them out of the Third Division in season 2008/09. As manager of Berwick Rangers, he won the Third Division in 2006/07 and was manager at St Mirren for a year from December 2002. The club statement also said: "The club would also like to thank John's staff - Matt Kerr, assistant manager, coach Arthur Bell and goalkeeping coach Alex Connon for all their hard work during their time at the club."